How to Convert MKV to M4V for Apple TV iPhone iPad etc. I have a bunch of MKV files that I want to convert to M4V files. I recently tried converting the MKV files to M4V using Handbrake. But I ended up with a short audio file without sound. So I tried Subler to convert my MKV files to M4V, and the audio, as well as the video, are in language "Unknown". What's the problem? MKV is a popular container format. It's common you have lots of movie or video files in MKV that is unsupported by Apple device you'd like to play them on, for example, an iPhone or iPad, Apple TV, or your Mac. You have scads of free video converters for Mac/Windows to choose to convert MKV videos to M4V - Handbrake, online converters, Freemake, MacX Video Converter Free Edition. But if you want to convert MKV to M4V quickly without more ado, try the the program below. Handbrake allows to convert MKV videos to M4V free quickly, but it may mess the output video and audio. The maximum file size users can convert using online tools is 100MB, which is far from enough. 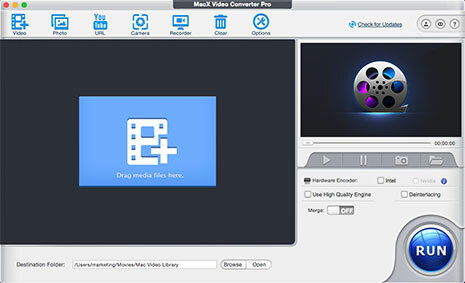 Without more fuss and bother, free download MacX Video Converter Pro, a top-notch MKV to MP4 converter that lets you convert MKV to M4V without manually transcoding for iPhone iPad Apple TV iTunes etc. with the fastest speed and the highest possible quality. 1. HQ engine, multi-core CPU processing, HT and hardware encoding tech enable an unbeatable speed and quality. 2. 400+ preset profiles are offered, including the latest iPhone X/8. 3. Edit MKV file before conversion, such as trimming, adding watermark/subtitles, compressing. 4. The video converter for Mac/Windows is built with 370+ video audio codecs, allowing you to convert nearly any video you can tell, like MKV to MP4, M4V to AVI, WMV to MOV, H265 to H.264 and more. 5. Download videos of MKV, MP4, FLV, or HEVC etc. from YouTube, Vimeo, Dailymotion, 300+ sites. Free download the program (macOS High Sierra also supported), or for Windows and launch the program. Click Add Video icon in the upper-left corner, and select source MKV files to load from the window. Batch conversion is supported. You can add more than one MKV file at a time. Alternatively, it allows users to add source videos with simple drag-and-drop. It opens videos quickly. Better still, the program works as a HD video converter that gives wonderful HD/4K UHD video conversion performance. After the video is loaded successfully, an Output Profile window will pop up. 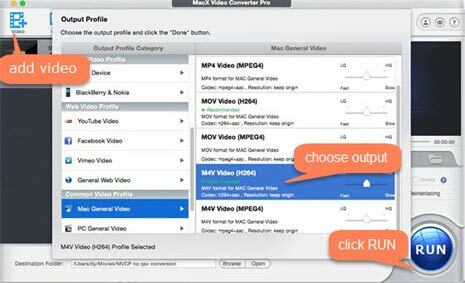 Click Mac General Video under Output Profile Category on the left pane, select "M4V Video (H264)", and click OK to save the output profile setting. Tips: You can click Settings icon to get more video and audio options, like video audio codecs, frame rate, aspect ratio, bit rate, resolution, audio channels etc. Follow the guide to compress MKV to a smaller size to save space for iPhone iPad. It's quite the same to convert MKV to MP4, MKV to AVI, QuickTime MOV to M4V, MP4 to M4V, WMV to MOV, AVI to MP4, or to convert other SD and HD video format. You can click the Browse button to select a destination folder to save converted files. Then click "RUN" to start to free convert MKV to M4V without further transcoding on Mac or Windows. After the conversion process is finished, you can transfer converted M4V files to iPhone iPad or iPod with iOS file manager tool like iTunes. Without further bother, we recommend you to resort to MacX MediaTrans that lets you quickly transfer M4V videos to iPhone iPad or iPod in batch or one by one and manage iOS data in a way easier than iTunes. Free download the best video converter for Mac/Windows to decode MKV files to M4V, as well as AVI to M4V, MKV to MP4, M4V to MP4, AVI to MP4, AVCHD to iPhone, FLV to iPhone, YouTube to MP4/MP3, etc. Also a good video editor and compressor to split/trim/crop/rotate video, add subtitles, adjust video resolution, frame rate, bitrate, aspect ratio and other video parameters, etc. Fast Transfer MKV to M4V for iPhone iPad iPod etc.